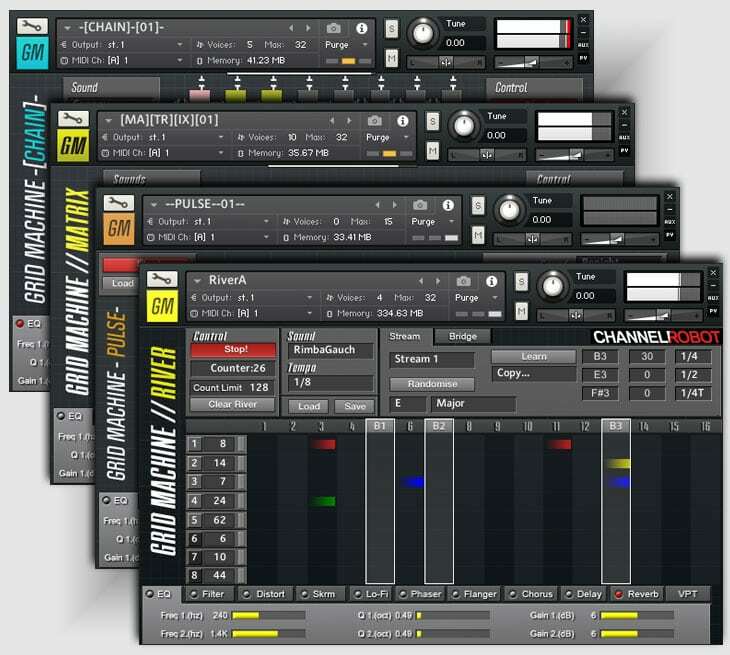 This collection takes the 4 unique sequencers from Channel Robot and loads them up with drum sounds – Ready for you to create stunning new rhythmic drum patterns and sequences. So all those cute chromatic sequencers we built turn out to be pretty good as drum sequencers too. Each offers you a different route to new rhythmic–stutterifc-mad-lazy-cool noise loops. We loaded each of them with our catalogue of Kicks, Snares, Hats, Toms and Percussion from the Factory Collection, then added over 25 kits from Solid Drums. Will you get 4-on-the-floor goodness here? Well you *could* if you were either (un)lucky or worked at it, but really we assume you’ve got that sort of thing covered – this is more about pressing the randomise buttons and getting all new out-there drum patterns, loops and noises, quickly, easily and surprisingly.